Without question, this is a consultant’s dream situation as it is much easier, and quicker, to simply swap ITSM tools. The fact that there are hundreds of Silver, Gold, Copper certified ITSM implementation firms, ready to change your tool every three, five, six, or seven years depending on which way the wind is blowing validates the readiness for this type of engagement. There are certainly situations in which a sudden investment in an alternative tool makes sense. However, it is essential that the trusted ITIL expert bring balance and objectivity to the table when a replacement tool is being considered. Sometimes, it is best to take a step back and evaluate the underlying processes before proceeding. In addition, a good ITSM implementation specialist will review your process and procedures and make recommendations prior to a tool implementation. I thought it would be interesting to share the 5 top reasons a client might want us to “jump right in” and the balance and objectivity that we strive to bring to each engagement. The help desk is usually a good place to start but that’s just one piece of the puzzle. What about the upstream and downstream service providers that need to support the help desk to deliver support to their customers? (Level 3 support for example or any other team entirely if the resolution of the issue lies outside of the purview of the help desk.). How are those teams organized? Do they follow the same processes? Are they using the same ITSM tool? Are there OLA’s in place? Are they being met? Are they being tracked? Are issues sent “outside” of the help desk tracked in the same way? (Are they tracked at all?) If there are other geographical, application, technology, or business unit help desks, are they all following the same processes? Are they providing the same level of service to their customers or does service differ based on which help desk or support team a customer might call? If that were indeed the case, that would be amazing, but in most organizations, there are processes that are further developed & others that are less developed (more mature/less mature). In fact, after Incident Management and Change Management, Release & Deployment are the next most problematic processes for many organizations. Ironically, from an ITIL process maturity perspective, we often find that the help desk is often further along than some of the other teams because they’ve been leveraging “ticketing systems” longer than other teams & have already internalized the accompanying operational disciplines. From the perspective of laying out the design of the Service Management project, deciding which processes you launch and in which order, absolutely influences project design decisions. (Ex. Do you include Event as you’re doing Incident or is Event in good shape? Is the organization ready for Demand Management and Business Relationship Management or should that be deferred? Should the focus be on automation or on the basic processes? Money doesn’t grow on trees which is why it shouldn’t be wasted either. Depending on the size and scope of the project, a tool implementation can take months, require the time of people within the organization, and in most cases, leverage third party implementation consultants. With this much of an investment at stake, doesn’t it make sense to ensure that the path you are about to embark on is the right one for your organization and not simply one which follows an out of the box implementation? There is a saying that I’m quite fond of, “There’s never enough time to do things right, but there’s always enough time to do things twice.” How many times have you seen people fix the same issue over & over again because they have not taken the time to get to the root cause or “the real problem”? Successful Generals don’t rush into a battle without first understanding enemy troop strength, troop placement, or the terrain of the perspective battlefield. Why not take a similar approach on your project and take the time to get the lay of the land. There should always be time to do things the right way and avoid the cost to the project, and your reputation, incurred by having to do things twice. This is just about the worst thing that you can do whether you are the client or the consultant. Unfortunately, this approach is not as uncommon as you might think. In fact, OwlPoint has been called in several times to rescue clients this very situation. Our recommendation, and our firm brief, is that the success of the project lies in defining the right processes first. Automating a broken process does an organization no good. In fact, it usually leads to nothing but wasted time, wasted opportunity, rework, and a damaged reputation for IT. In the grand scheme of the project spend, investing in an initial Assessment often makes ense. Assessments show you where you really are so that you can plot the right course to get you where you need to be. An assessment from an impartial, third party, experienced, subject matter expert, gives IT leadership an unbiased picture of the current state of the organization along with an actionable roadmap designed to develop those specific areas requiring further attention, while avoiding those that are in good shape. In other words, it helps you find that balance. Finding the right balance is the art behind the science of IT Service Management and tools implementation and partnering with “an artist” may be the difference between a successful initiative and rework. If we can help you with our expertise in the area of Service Management Assessments, ITIL process development, or Service Management program implementations, click here and complete the Contact Form on the Contact Us page of our website. We would be happy to set up a brief call to discuss how we may be of assistance. Next: Where does innovation belong in the IT Organization? 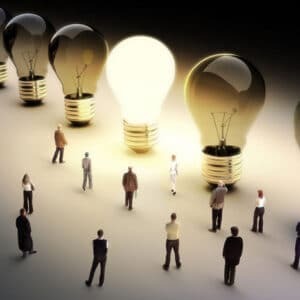 Where does innovation belong in the IT Organization?